Yesterday I met up with an old friend – both of us are getting quite old, though Mike Seaborne is rather younger than me – and we had a drink before going on a short gallery crawl. But in the pub we talked a little about our current work, and I took along a copy of my last book, Rotherhithe & Surrey Docks, which he had not yet seen. Both Mike and I take panoramic photographs – and you can see quite a few of his on his web site. Although I like Mike’s work, and admire his panoramas, we have some basic differences in how we work although often we photograph the same subject matter. So one set of pictures on his site is from Swanscombe, which I photographed back in the 1980s, and then in the 1990s and early 2000s returned and made panoramic images. Both of us have photographed extensively elsewhere around the Thames Estuary too, although the work on his web site is not panoramic, although it was made by stitching together a pair of images. There are I think two things that qualify a photograph as panoramic. One is the format, which has to be significantly more elongated than the standard 1.5:1 of the 35mm frame. Many cameras now also allow you to take 16:9 images (1.78:1) which to me doesn’t quite cut it as panoramic – just ‘widescreen’. As a working definition I’ve arbitrarily decided that panoramic format starts at around 2:1, and currently I mainly actually work at 1.9:1. The swing lens cameras that I worked with on film generally had an aspect ratio of around 2.4:1 and I chose these when I first bought a specialised camera largely because I thought that this was the optimum format for panoramic images. Mike thinks differently and likes to work with images around 3:1, though has produced at least one 360 degree panoramic which was (from memory) around 9:1, about 18 feet long and 2 foot tall. Of course there are panoramic images that don’t really have an aspect ratio, particularly 360 degree spherical images, which you can only see through an on-screen viewing window. Useful for house agents, but not – so far as I’m concerned – for any serious photography. But a large aspect ratio doesn’t make a photograph a panorama – it makes it panoramic format.For me the other necessary element of a panorama is a wide angle of view. It has to be a very wide angle, and although I liked using my Hasselblad X-Pan with its normal 45 mm lens, I never felt it was producing panoramas. It was only when I added the 30mm lens that I felt the images were truly panoramic. The 30mm gives a horizontal angle of view of around 94 degrees, which is at about the useful working limit of rectilinear perspective – at greater angles the distortion usually becomes unacceptable. A horizontal angle of view of greater than 90 degrees is often taken as the minimum for a true panorama. Swing lens cameras -such as the Widelux and Horizon models I used, generally gave an angle of view of around 120-130 degrees. The images I’m making now usually have a horizontal angle of view a little greater than this, at around 146 degrees, but they also have a larger vertical angle of view than those from swing lens cameras, and if uncropped have an aspect ration similar to that of a normal 35mm frame rather than anything more panoramic. The vertical angle of view of a swing lens camera is limited, because a wider vertical view would lead to distortion and unsharpness due to the different film to lens distances away from the middle of the image. The cameras use a curved film (I almost wrote a curved film plane – but of course the film forms a part of a cylinder, with the lens at the centre of the cylinder. Along the centre line of the image there is a constant film to lens centre distance, but as you go up or down from the centre that distance increases, giving greater magnification and also becoming out of focus. You can avoid these effects by using a fisheye lens – but of course that produces a ‘fisheye’ image. In the pre-digital age there was little you could do but learn to love them, but I seldom did. But thanks to the work of Prof Dr Helmut Dersch and his ‘Panorama Tools‘ and the many free or commercial products that developed from his mathematical insights we can now do almost what we like with them. 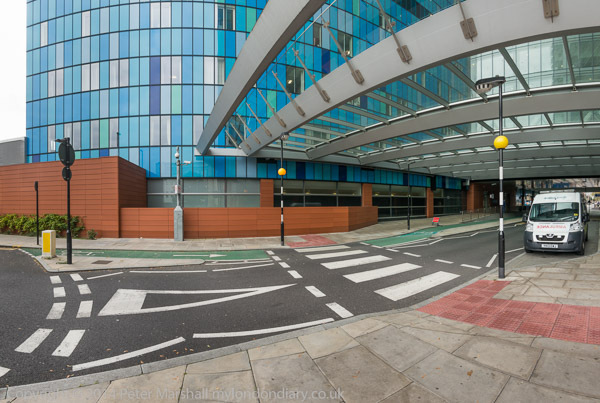 In By the Royal London you can see a number of images, some stitched and others converted from a single fisheye original. 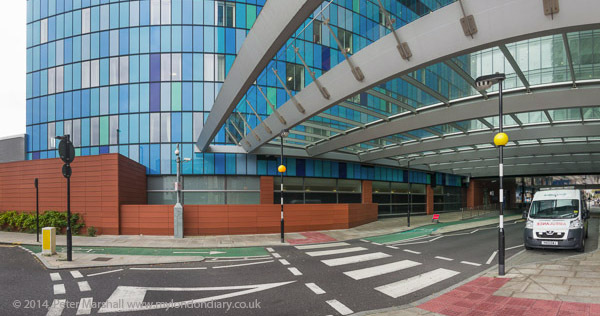 I’d gone to Whitechapel to photograph an event, but had time before it got going to take a short walk and to retake an image I’d made as a multi-image panorama around 18 months ago. of the new hospital building. One of several attempts is the top image above, shown in its ‘full-frame’ version. And this is my ‘panoramic crop’ version of that same image. In taking the picture I had to carefully set the left and right boundaries of the frame, and ensure that the camera was level. In the viewfinder I could see the top and bottom centre of the top image, but not precisely where the four corners would be – and there are different ways of processing the image that would give different results, although I’ve generally standardise on the particular method used here. And as you can see, when cropping to the 1.9:1 format I had considerable choice of where to place the frame – the equivalent when taking an image in the old days on a view camera with a rising/falling front. I think the crop improves the image, but in this case I rather like the uncropped image too – and I think despite that ration is still is panoramic, though less contentiously I’d simply call it ultrawide. But really the name doesn’t matter. For this picture I possibly wanted more of the top of the building and the roof, and tried to get this by stitching a series of images taken in vertical format with a 16mm lens. I hadn’t however taken my tripod with me to lean on and stitching the images proved a little tricky. You can see one attempt on My London Diary, along with around 15 other pictures I took in the area, all shown converted to give straight verticals, but otherwise uncropped. Most aren’t among my best pictures, but most would be improved by a crop to 1.9:1 format. But if I wanted to use the 3:1 ratio that Mike prefers I would have to work differently. This entry was posted on Friday, December 5th, 2014 at 11:44 pm and is filed under My Own Work, Photo Issues, Photographers. You can follow any responses to this entry through the RSS 2.0 feed. You can leave a response, or trackback from your own site.